In Native American Indian culture, the wolf was one of the power animals and was also known as the pathfinder. 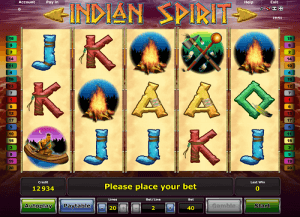 Just like the chief does when he appears during this slot game, players of Indian Spirit can call on their inner wolf to help them find the paths of the winning symbols. With 5 reels and 20 paylines, there are many different paths the winning symbols might take but when you find them, you will be handsomely rewarded. With fantastic, transforming symbols and evocative sound effects and music, this slot brought to you by NovomaticCasino.co.uk will have you feeling as if you’re sitting round a crackling camp fire, surrounded by your tribesmen, awaiting a comfortable night’s sleep in your tepee. Young boys would be trained, almost right from birth, to help them become the best warrior they could, in every sense of the word, for their tribe – to protect their friends, their family and their livelihood from rivals. However, you don’t need any training to play Indian Spirit, in fact, you don’t even have to be a seasoned slot player to enjoy it. Your balance is clearly displayed for you at the bottom left of your screen, and your winnings displayed on the right. Your bet level is in the middle and you can change this at any time by using the plus and minus symbols, and also upping or lowering the number of lines you’re betting on. If at any point you need a little extra help, you can consult the paytable to see how much each symbol is worth, depending on your bet level, and how many you need to spin in order to win. Once you get the hang of the game and you’re happy with your bet level, you can set the game to ‘autoplay’ and let the reels spin and win for you all on their own. Some of the transforming symbols in Indian Spirit include a warrior in a canoe, a crackling fire, traditional weapons and the chief himself. The chief transforms into a wolf with eyes of flame and the dream catcher, whenever it appears, transforms into a wolf howling at the moon. The dream catcher in Indian Spirit is the Wild symbol, and this substitutes for all other symbols, except the Scatter. The Scatter is a soaring eagle, which squawks every time it appears, and if you spin three or more of the Scatter symbol, you’ll be rewarded with free spins! As you spin the reels during your free spins, the dream catcher grows in abundance and appears all the more often – giving you the best chance to be the ultimate pathfinder and find those winning combinations. Even during your free spins, and whenever else during the game, except during autoplay, each and every time you get a payout, you can use the trusty double-or-nothing gamble feature. Take your win and see if you can double it! All you have to do is correctly guess whether the next card to be turned over is red or black. Get it right and you’ll double your win, with yet another opportunity to double it again! As with most other NovomaticCasino.co.uk’s slots, you can practise for free until you’re ready to play with and win real money! Fans of Book of Maya will enjoy this online slot as well as those who like to play Aztec Power. NovomaticCasino.co.uk also has some fantastic table games for you to play, such as: Poker, Roulette and Sic Bo.